British Columbia's rivers, lakes and streams offer some of the finest kayaking and canoeing in the world, amid spectacular scenery. For sea kayaking, the BC coastline with the Pacific Ocean at its doorstep forms long, deep fjords and inlets that are teeming with fish and the lands are abundant with wildlife. The different topography and elements of this land are amazing and unmatched. One of the more interesting ways to enjoy the beauty and wilderness that comprise British Columbia is to canoe and kayak the lakes, rivers and the inlets throughout the province. 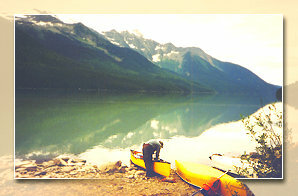 BC's many and experienced canoe and kayak tour companies offer professional services throughout the province. Many resorts provide canoes and kayaks for their guests, or are simply excellent locations to launch your own.